Let's explore the topic of Crop Circles. In the past 25 years, more than 10,000 crop circle formations have been found in more than 29 countries: England, United States, Canada, Germany, Australia, The Netherlands, Hungary, Japan, Wales, France, Scotland, Switzerland, Czech Republic, Austria, Italy, New Zealand, Russia, Finland, Israel, Poland, Brazil, Mexico, India, Sweden, Ireland, Yugoslavia, China, Argentina, Croatia, Denmark, Peru, Romania, Siberia, Slovakia, Spain, Turkey, Afghanistan, Bulgaria, Chile, Egypt, Isle-of-Man, Lithuania, Luxembourg, Malaysia, Nigeria, Norway, Sardinia, Tasmania, Ukraine, Uruguay, etc. Most of the elaborate crop circles found, are found around England's ancient and sacred site areas (Stonehenge, the earth mound of Silbury Hill, Avebury, Cheesefoot Head, etc.). Southern England is where around 90% of the elaborate crop circle formations and designs are found. A mystery that has had many people looking for the truth. In this thread we went ahead and compiled various research on the topic of Crop Circles and related phenomena. I wanted to include every angle possible and implore you to arrive to your own conclusions. If you have anything you would like to contribute, share, discuss, feel free to reply to this thread. Thank you for taking the time to read these, and while these are amazing phenomena, it is up to the viewer to interpret its meaning and what resonates most with you. David Wilcock talked about Crop Circles in Season 23 of his Wisdom Teachings on the Gaia Network. 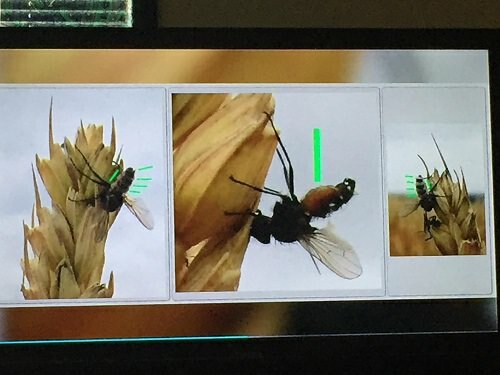 He included some of the information found here as well as other information such as pictures of where the wheat bend at the node of the stock, and photos of insects being stuck to the wheat after these crop circles being formed. Also included in the video is an actual crop circle formation taking place, with what appears to be an orb of light moving about and the wheat simultaneously being pressed down. Amazing footage. Here are the mentioned photographs. More than 10,000 Crop Circle formations (Agriglyphs) have been found or cataloged worldwide. More than 6,000 crop circles have been investigated and documented since 1980. The Crop Circle phenomena has also been found frozen bodies of water and sand. More than 80 witnesses have witnessed crop circles being created within a few seconds by one or more balls of light (orbs). In 1989, a Japanese TV crew filmed a crop circle forming in the early hours of the morning. The film footage shows a swirling motion of energy forming a crop circle, which lasted less than 15 seconds. When a man-made crop circle is found, the grain stalks are broken, the formations are usually jagged and the formations do not have any symmetry. Because of the disinformation spread by the media, most people think that all crop circles have been produced by pranksters with a plank, a garden roller, ladders, ropes and measuring tools. There have been some crop circles that have been man-made that look like the real thing, but they have taken a group of people days to complete and the crop stalks are broken in the process. The disinformation and non-media coverage of crop circle formations actually protects the farmers and their harvest from damage caused by researchers and the curious trampling their crop circle grains, harvest and lands. Some people still believe aliens or UFOs from outer space create crop circles. A majority of the world's crop circles are within a 40 mile radius of Stonehenge. The dimensions of most of the early single crop circles would fit inside the inner horseshoe at Stonehenge. Most crop circles with single and double rings would fit within the inner and outer edges of the first ring of stones at Stonehenge. Dolores Cannon, the world's leading hypnotist and regression hypnotherapist, has been hypnotizing people for more than 40 years. Around 30 years ago, Dolores Cannon found that all the techniques of hypnosis that she had learned and was using, were not producing the results that she wanted, so she developed her own techniques of hypnosis. Most regression hypnotherapist usually get a subject to enter into the somnambulistic state around 10% of the time. The technique of hypnosis that Dolores Cannon has developed, has around a 90% success rate of getting the subject to enter into the deepest state of hypnosis (the somnambulistic state). While her subjects are hypnotized and in the deepest state of hypnosis (the somnambulistic state), she asks questions and is given information. Some of the information she has received through the years can be found in some of her multiple published books. The most important information to comprehend from her "Convoluted Universe" book series is found in " The Convoluted Universe, Book Three", on page 596, where she states: "Everything is energy. Everything is vibrating at different frequencies. Even rocks, furniture, etc. are vibrating, at a much lower, denser frequency.". In " The Convoluted Universe, Book Two," Dolores says: "I've also been told that when the scientists finally get to Mars, they will not realize that there is life still there. They won't recognize it." Do the balls of light entities that coexist on our planet, also exist on Mars? In the "The Convoluted Universe, Book One", page 277, in the section "Crop Circles": Dolores asks a subject: "What can you tell me about the crop circles that have appearing in England? I know they are appearing elsewhere, but they seem to be more defined over there with symbols and are much more elaborate. Can you tell me anything more about who is making them and how they are being made?" Dolores: "You don't want to answer that question?" Phil: "The higher forms of communication on your planet now are understood to be in terms of binary or computer languages. In your common belief system the highest forms of communication are accomplished through your scientists, and are therefore not understood by the masses in general. These crop circles are intended to convey to the masses the information which is being given to your planet, so that the populace as a whole understands that the nature of your existence is radically different from that which is commonly believed to be the accepted point of view. That all is not as it seems. Those who would undertake such an endeavor are attempting to communicate in a way that resonates with each individual on a highly personal level, on levels that each individual is open to, and not simply given." Dolores: "Who or what is creating the crop circles?" Phil: "The entire answer to such a question would not be possible in this context, in that it would be necessary to give an entire discourse on the origins of the human race as a whole. But we should say that these symbols are relevant to the history of life on your planet. It is a geography lesson in the origins of your planetary life forms. And there are those who are now coming to slowly recognize the significance of these symbols, in that they convey meanings. They are not simply random acts of art. They are indeed forms of communication. Those who are knowledgeable in this form of communication will slowly come to the realization that they are being communicated to, and they then will understand the message that is being transmitted, as to the origins of life on this planet." Dolores: "Can you tell me how the crop circles are made?" Phil: "The process itself is not so mysterious, but simply is being used on a scale that is not common in your world. There are those who are able to direct the energies into concentrated forms, such that the molecular structures of these plants are thus altered. It would be as bending a twig, such that the force of bending it is not external but internal. It is simply a realignment of the structures themselves, and not the environment." Dolores: "We're thinking it's the use of some type of energy." "They’re real and contain hidden messages", scientist says. A scientist who has dedicated his life to researching UFO crop circles says there are “puzzles” in them containing secret messages. 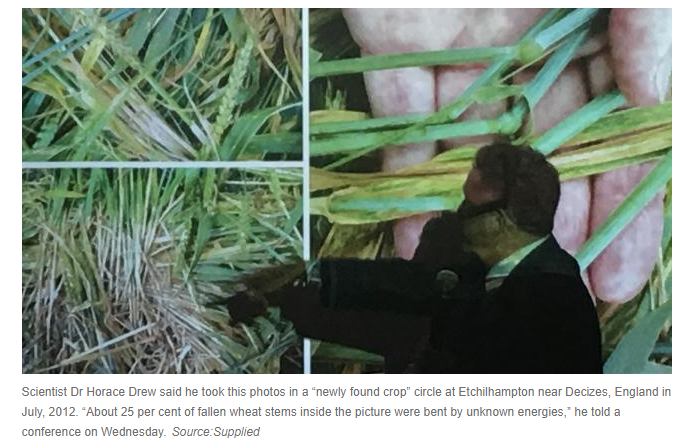 Dr Drew said the circles appeared to be created by an “unknown energy that heats the crops up”. “It’s like microwave energy but is something beyond earth’s science,” he said. “It can pattern the wheat. But there’s nothing to fear, according to him. This is only part of the article. To read the full article click here or go to the sources provided at the bottom. In the field of Crop Circle Plant Analysis and Research (radioactivity measurements, spectrographic analysis, magnetometer readings, microscopic inspection, cellular plant experiments, weighing, photographing, etc. ): High-pressure infrasound is capable of boiling water inside plant stems in one nanosecond, causing the water to steam, and leaving tiny blowholes in the plants’ nodes. Research and laboratory tests prove that infrasound (less than 20 Hz) is capable of producing such an effect. This process creates surface charring along the stems. Microwave radiation (high frequency electromagnetic waves) is also believed to be how the stalks are bent and the plant's nodes are swollen. Farmers have reported that when they find a new crop circle, they have seen steam rising into the air from within the design. Crop circles also show the possible existence of ultrasound also. Several people have reported hearing a trilling sound prior to witnessing crop circles forming. They also report a total stillness in the air (no wind) and total quiet. This trilling sound was captured on magnetic tape and analyzed at NASA's Jet Propulsion Lab as being mechanical in nature with a frequency of 5.2kHz. Biophysical evidence shows the plant's nodes and stems are drastically extended, seed embryos are altered, and their is the existence of expulsion cavities, as if they have been heated from the inside, and germination abnormalities. Using chemical plant analysis of the crop samples inside a crop circle, the researchers have found starch crystals and lattice structures never seen before. There is also a reorganization of the plant’s crystalline structure (organic structure has been chemically altered). A malt fragrance can also be smelled after cutting open a stem from a freshly made crop circle, which means that the plant has been cooked from the inside, but the crop remains unharmed. Exhaustive lab analysis into hundreds of 1991-1995 crop circles shows physical and biophysical changes to the plants inside a crop circle. There are also alterations in the germination, development of seed embryos, and alterations in the plant's stem node length and circumference (up to 200% increase in one case). 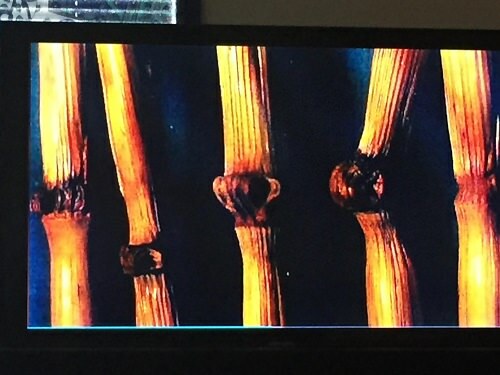 The grains from crop circle plants can grow 40% to 50% larger, have a stronger and larger root system, and have larger grains than the grains from the crop surrounding the crop circle. Alternatively, some crop circle plants produce seeds that are smaller than normal plants. The reason for the differences in the plants may be water supply available when the formation was made, the age of the plant when the event occurs or the type of plant. The internal structure of the plants is altered at the cellular level. The cell pit walls of the plants are fractured and expanded. In grain crops, there are nodes close to the ground that help the plant grow vertically. Crop circle plants have expanded, elongated or "blown nodes" nodes. The plants with the largest node expansion are found in the center of a crop circle. Researchers have found distinct changes in crop circle soil temperature, composition, and crystalline structure in the soil and within the crops inside the formations. It has been scientifically documented that soil samples taken from within crop circles, show changes to the soil's crystalline structure and mineral composition, and the soil appears to have been baked. Analysis concluded that a heat of 1,500°C would be required to create such a change. Ten non-naturally occurring, short-life radioactive isotopes (Vanadium 48, Rhodium 102, Rhodium 102m, Tellurium 119m, Iodine 126, Europium 146, Ytterbium 169, Lead 203, Bismuth 205, and Protactinium 230), that dissipate in 3 to 4 hours and can only be synthesized in cyclotrons or fusion reactors, have also been found in the soil. Soil tests have also shown that alpha emissions are around 200% above normal, beta emissions are around 50% above normal, and the soil is 2 to 3 times as radioactive as the soil outside the crop circle. 50-100 micron diameter spherical beads of pure iron have also been found within crop circles. Large quantities of surface and subsurface water (up to millions of gallons water) in and around a crop circle disappear while a formation is produced. Aerial photography, using infrared film, shows the groundwater under a crop circle is depleted for several days to a week or more before the water table returns to normal. The soil within a crop circle formation is generally dry, cracked and dehydrated, even after heavy rain. Will add newer crop circle images as soon as I get a good collection going. In August 2001, an Extraterrestrial face and disk message crop circle appeared. 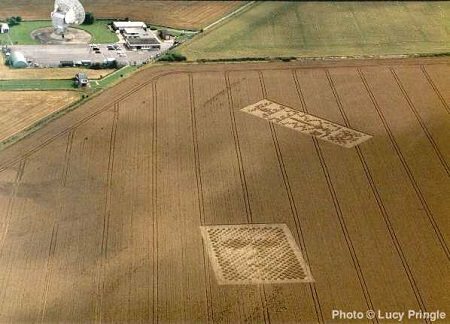 Almost a year later to the day, the same crop circle was formed in a wheat field in Crabwood, Hampshire UK on August 15, 2002 and had the same Extraterrestrial face with a binary coded disk message. The late Paul Vigay decoded the binary coded message on the disc. Beware of bearers of false gifts and broken promises. Much pain but there is still time. There is still good out there. Also in 2002, 24 Ancient Crystal Skulls (16 human size and 8 small Crystal Skulls) and 3 large Disks were found buried in caves in the Tibetan Himalayas. The disks look like CD’s and were believed to be made of cobalt and another metallic substance. The disks looked similar to the crop circle disk of 2001 & 2002, with etchings in binary code. 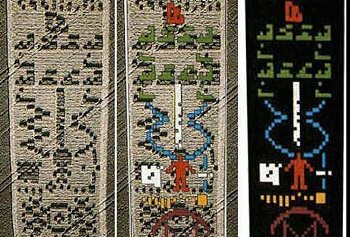 In 1974, a broadcast (known as the “Arecibo” message) put together by Carl Sagan and colleagues was sent into space via radio waves at a special ceremony to celebrate the re-modelling of the Arecibo radio telescope in Puerto Rico. It was the most powerful broadcast ever deliberately beamed out into space. Directed at a star cluster sitting approximately 25,000 light years away, it consisted of a pictorial message depicting our planet’s location in our solar system, the core principles of our math and science, and the NASA antenna used to transmit the signal in the hopes that it would be interpreted by an extraterrestrial intelligence. The message also included details about human beings, such as our physical appearance and DNA code. The signal was a million times stronger than the typical TV transmission. You can see the message in the cover photo (above). Above is a picture of what seems to be the response to the message sent out in 1974 by NASA (see cover photo). The message describes a different solar system, an image of the sender (just like on the original NASA message), non-human DNA, and a microwave antenna instead of the radio-wave antenna that was depicted in ours. A simple Google search would suffice if you want to see more pictures. It was written off as a hoax, like most crop circles are within the mainstream. The face you see there appeared three days before the rectangular image. The face represented a new technique in crop circle generation, a screen technique that is also used for printing a face on a piece of paper. 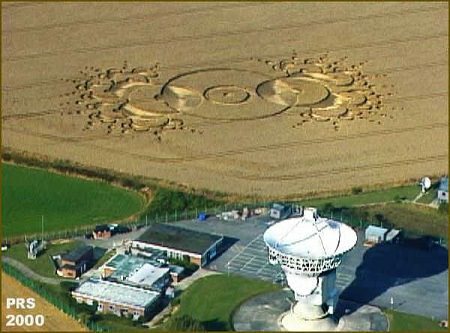 What’s also interesting to note is the fact that the microwave antenna signal in this crop circle also appeared a year earlier in the exact same field. You can view an image of that one here & below. 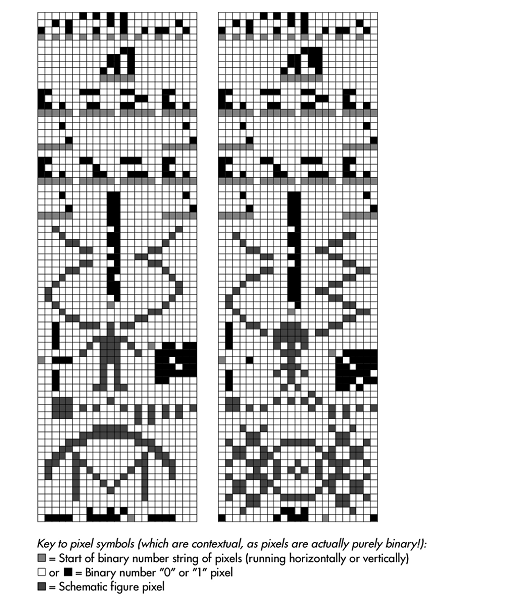 The Arecibo message sent out into space was in binary, and I thought it would be fitting to source a declassified NSA (National Security Agency) document titled “Key To The Extraterrestrial Messages.” This document reveals that they received a series of 29 messages from outer space that also appear to be in some binary form. The title of the document alone is quite shocking given the fact that it comes straight from the NSA. This video basically sums up this whole topic. I went ahead and made a transcript of this video which you can find down below. The original video was deleted but I have since re-uploaded it and will continue to do so if need be. The following text is channeled by a man named Darryl Anka. Who is Bashar? "A friend from the future who has spoken for the past 21 years through channel, Darryl Anka, bringing through a wave of new information that clearly explains in detail how the universe works and how each person creates the reality they experience." For more information on Bashar, click the above link. That is Darryl's official website. Question: About the crop circles in England, Can you speak about who or what energy is that creates them? Bashar: We will say this. It is a co-created situation by many different consciousness INCLUDING all of yours. I will put it to you this way. The energy that is manipulated is the energy of your collective consciousness. Of your planet. Collective consciousness. The symbols, are expressions of the DREAMING that is going on that is symbolic dreaming, going on, in your collective consciousness now that is it "waking up" and talking to itself. There are other dimensional beings, extra-terrestrial beings, others "levels" of entities that are also involved in this co-creation. But basically what those symbols represent, is the collective consciousness of your entire world, speaking to itself, communicating to itself, waking itself up, out of a long long long long dream. Into a new dream. A bridge. They're a bridge; a link, they're a language from one reality shift to another. Understand them by energy, understand them by tone, understand them by form, understand them by how they allow you to feel. Understand them by ratio, by mathematics, understand them in any language you wish to. Because they are universal in that sense. And they are the language of your universal collective unconsciousness becoming more conscious. You are waking up. And many beings are helping play in those fields, as you say, in the fields of the lord. The One is All and the All are One . Change is the only constant… Except for the first three laws, which never change. Bashar videos can be found HERE, and all over YouTube as well. Crop Circle Researcher Colin Andrews author of the book: "CROP CIRCLES - Signs of Contact" and co-author of the book: "Circular Evidence", has been researching crop circles for than 20 years and has compiled the largest database on crop circles. Colin has cataloged hundreds of authentic and man-made crop circles in his crop research career. The late philanthropist Laurence Rockefeller began funding Colin Andrews' research into real and fake crop circles back in 1999. Some of the man-made fake crop circles that Colin has found are shown to the left. Notice the difference between the fake crop circles above and the real crop circles shown below. In 1991 Doug Bower and Dave Chorley, of Southampton, England, confessed to having made more than 200 crop circles since the late 1970s with nothing more complex than ropes and boards. They had initially been inspired by a 1966 account of a UFO sighting near Tully, Queensland, Australia. Although they managed to pull off a small hoax, and fool a few journalists, it is far too easy to tell the difference between real and hoaxed crop circles. One tell tale sign is if physical force was exerted on the wheat stocks instead of the gnode of the plant itself melting at the center point due to some microwave energy we aren't familiar with yet. Regardless of their pranks, the crop circle phenomena is rich in art and sacred geometry. Considering over 10,000 crop circles have been cataloged, and many more not even reported, it's easy to compare the scale it would take to successfully fake all of the crop circles. While they can claim faking 200 to their name, that hardly pails in comparison to the 10,000+ crop circles reported world wide the last 25 years. 200 is a drop in a bucket compared to the astronomical amount of crop circles found and recorded every year, and continue to this day. Hi WeAreAllOne, I can't thank you enough for everything that has been included on this forum, I agree with all that has been said. You are certainly doing a great job of running this forum.